It's really not worth it to go over the number of times James Cameron has promised, then delayed his Avatar sequels, of which there will four of them. Let's just say the first one should have been here around 2014, go give you an idea how long it's been. And while there doesn't seem to be much of a clamor for them at this point, he continues to push forward, perhaps in an effort to stretch the boundaries of visual technology, which has always been a passion for him. Now he's apparently ready enough to give dating these movies another go. Avatar 5— December 19, 2025. 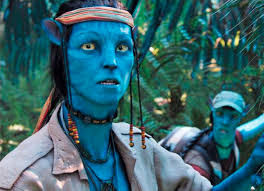 That's a lot of blue-skinned natives battling to save forests or whatever that first movie was about. Honestly, I don't remember anymore. The first movie hit in 2009 and it arrived at a time when we were hyper curious about 3D technology, and rode that curiosity to nearly $2.8B in profits worldwide. Is a eleven year gap a little too much to overcome, though? And don't forget, Avatar will have to do battle with Star Wars movies elbowing in on its theater count, too. The landscape isn't nearly as clear for Cameron this time around. So what happens if Avatar 2 underperforms? I have no doubt it'll struggle domestically but that it will be saved by overseas numbers. We'll see how it all shakes out in three years.